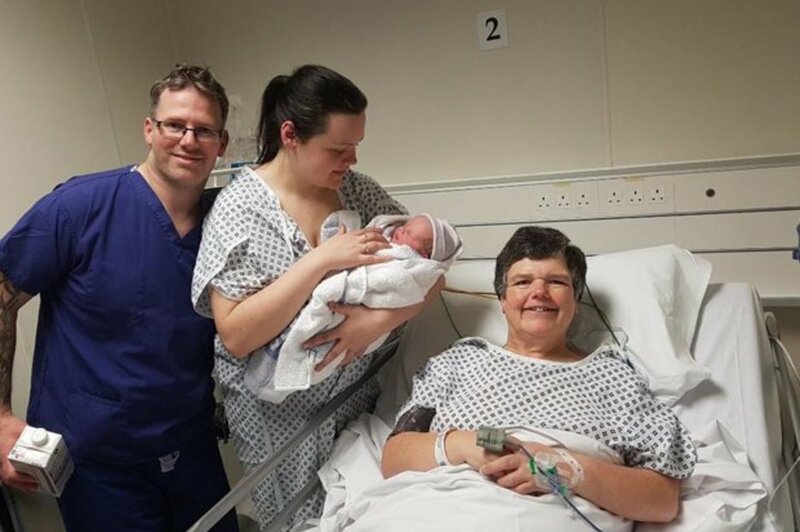 A selfless woman gave birth to her own grandchild – because her daughter is unable to carry a baby. Emma Miles, 55, stepped in to help Tracey Smith start a family of her own. The 31-year-old woman had previously feared she wouldn’t be able to have kids because she was born without a womb. Thankfully, her dreams to raise a child have finally come true thanks to her mum’s incredible act of kindness. While the couple considered using a surrogate to conceive a child, they worried there may be some risks. These fears convinced Tracey to ask her mum if she’d still be up for carrying her child. “I remembered mum’s promise to me. “So the next time we met up I asked her if she’d been serious about carrying our baby. “I was delighted when she replied: ‘of course I was’. Emma, of Lampeter, West Wales, lost six stone and took hormone tablets to prepare her body for IVF. The fertilisation process involved inseminating Tracey’s egg in a laboratory, before placing it into her mum’s womb to grow and develop. Against the odds, the procedure was successful at the first attempt. Evie Sian Emma Smith was delivered on January 16 – and the family couldn’t be happier. Following the birth, Adam and Tracey began undertaking the egal process of formally adopting Evie. Gushing about her baby joy, Tracey said: “Adam and I were allowed to both stay by mum’s side as Evie came into the world. “It was such an incredible emotional moment. I was so nervous that everything would go well for mum and for the safe arrival of our baby. “Every moment of heartache was so worth it just to have our little bundle in our arms. Emma, who his now a proud granny, added: “I don’t feel anymore attachment to Evie than any other proud grandmother. “Tracey is my baby and I did it all for her to be a mother. “Now I’m glad to be back to work and getting back to normal.